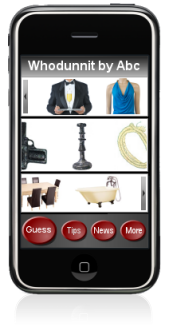 Interact with live TV programmes via an iPhone App displaying complementary content to support your programme. So let's be clear here, we're not talking about using the iPhone to stream TV or Video (as there are a myriad of ways to do this already) we're talking about enhancing the content you can distribute simultaneously via TV and an iPhone App (or any Smartphone app) to engage with a more interactive audience. So imagine you start seeing advertising announcing the return of your favourite 'whodunnit' to our screens. This same advertising is also promoting an app that allows you to participate by doing your own detective work. Whilst the show is airing you get to try to beat the on screen detective to the big reveal...tempting, yes? iPhone apps can be developed to synchronise with the start of the live broadcast, plus the same app can also allow for manual launch for the sky+ recording generation. We can also track levels of interaction and respective timelines to give enhanced audience viewing and participation stats. Uses for your TV iPhone App Development are endless. All with web and social media based live leader boards of who the fastest are, which geographic region is scoring the highest, best performing gender etc.. The format for your TV iPhone App Development is utterly adaptable from a one off app to go with a Christmas Special, to an app that follows a series, to an app that builds alongside a continuing series - the format is flexible enough to fit any schedule.